When I’m outside, my mind both calms and awakens. At least that’s the way I perceive it, and it seems I’m not alone. This may seem obvious to those of us who regularly search out solitary moments in nature, but it is not obvious to everyone. Observing tadpoles such as the one pictured above developing into frogs and walking horned toads on leashes of string were rites of passage for kids of my generation. 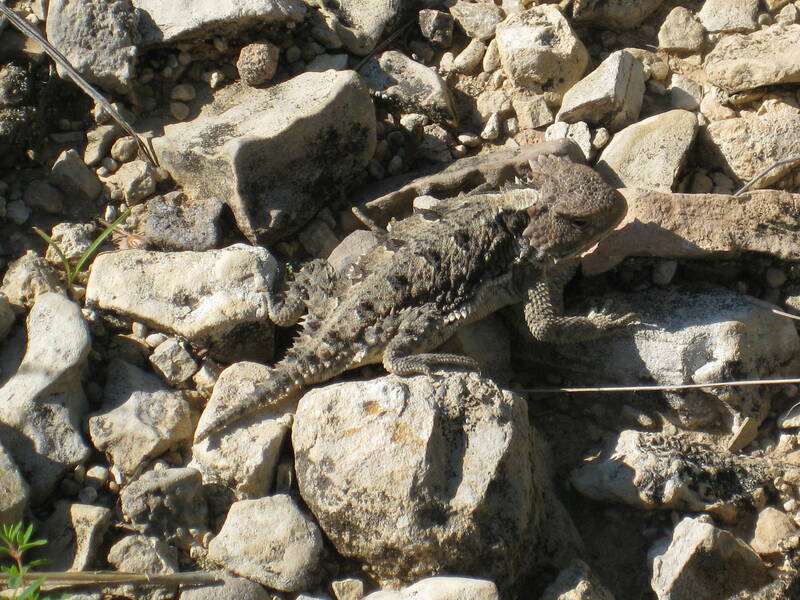 Now I not only grieve that horned toads are no longer as common here in the Texas hill country (I took the following photo in New Mexico), but I also fret that today’s youngsters experience much less time in nature. There was a child went forth every day,/And the first object he look’d upon, that object he became . . . The early lilacs became part of this child,/And grass and white and red morning glories, and white and red clover, and the song of the phoebe-bird. I have to wonder whether today’s children are “becoming” Whitman’s “song of the phoebe-bird” or Angry Birds. Throughout his book, Louv cites research that shows the importance of direct exposure to nature in the healthy physical and emotional development of children. He also shares copious evidence that a disconnection with nature may be linked to the problems of childhood obesity, attention disorders, and depression. Go placidly amid the noise and haste, and remember what peace there may be in silence . . . The publication of Last Child in the Woods helped spark a movement to encourage interaction between children and nature. For more information about how we can make a difference, visit Children and Nature Network at http://www.childrenandnature.org. Complete the following: Go ___________ amid the ____________. What specific things calm you? Do you know children or adults with whom you might share these? This entry was posted in awareness, birds, happiness, human stories, landscape, ordinary miracles, Texas hill country. Bookmark the permalink. Go sail amid the islands in the sky. Hi, Joe! Thank you for reading and sharing your “writing practice” responses. I love your phrasing and also the reminder that music has the power to calm. I’m envious of those who have knowledge of and talent for music. I am so impressed with Richard Louv and his work. His choice of the juxtaposition of Whitman’s poetry and the quote from a 4th grader as epigraphs really caught my attention. Thank you for reading and commenting, Vicki. What a lovely and touching description. I confess to loving air conditioning, but I remember with fondness the sounds of those summer nights of childhood. Thank you, Linda, for your thoughtful comments.